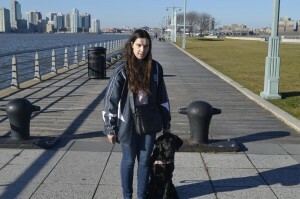 Francesca (Twitter handle @poetprodigy7): Working with her second guide dog, Zeus, AKA espresso on four legs. Writer, teacher, self-deprecatingly funny, sometimes refers to herself as the blind Bridget Jones. Addicted to coffee, chocolate, Colin Firth, and the Big Bang theory (not necessarily in that order). Francesca: Several weeks ago, on a cold, gray, misty Monday, I dutifully donned my raincoat and ventured into the downpour to take my guide dog for his evening constitutional. Under normal circumstances, he would, Labrador that he is, have raised no objections to getting wet; this day, however, he was recovering from a mysterious episode of stomach upset, and I might have foregone the walk until the rain subsided, but for the fact that I was endeavoring to avoid an unmitigated disaster of the nature that would require a professional carpet cleaner. Given that both of us were wet, tired, and anxious, it should come as no surprise that Zeus’s distraction resulted in us becoming slightly (or completely) disoriented. How was it that the dog who keeps me from falling down stairs and has been known to plant his paws between me and oncoming vehicles couldn’t even locate our front door? Too wet to ponder the incongruity of it all, when we finally found our way back home, I promptly sat down on the couch and cried for about fifteen minutes. Anyone who has ever been the two-legged part of a guide dog team knows this story all-too well, and yet as many of us will attest, even on the worst days—when your dog has barked in harness, or nicked a bite of your co-worker’s peanut butter sandwich—we’d far rather walk on the wild side of life with our crazy companions than take that journey alone. Between two dogs, I have a combined total of nearly eleven years of experience as a guide dog handler, and I use the term experience euphemistically here to mean: “I’m still alive, and not in a full body cast, so I must be doing something right.” When I experience moments of self-doubt, I sometimes force myself to step back and think about just how much my dogs have taught me about friendship, bravery, and blind faith. At the risk of sounding like the amazing guide dog whisperer, then, being a guide dog handler has taught me several lessons about life. 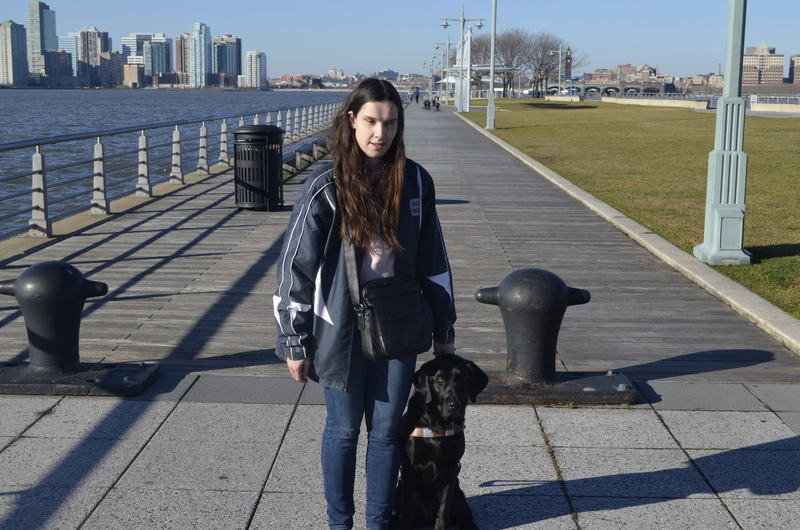 Blindbeader: 18 months ago, when I started training with my first guide dog, Jenny, I felt incredibly overwhelmed by the entire process. I had practical questions that had been asked and answered, but I wanted to know more about that emotional – almost mystical – bond between guide dog and handler. The problem was, I didn’t even know what questions to ask, much less the answers I needed to hear. Lately, I have come across many people who have just started training or just come home with new guides, as well as those that are in the application process or waiting for class dates. Here are many pointers that I wish someone had told me before I first opened my door – and my heart – to the most stubborn dog in the world. Jenny hates boats, and yet here we are waiting for one in NYC! Francesca: A bad day is just that: one day out of the hopefully innumerable ones I will live. When I have a bad day at work, I drown my sorrows in tears and vodka. When Zeus has a bad day at work, he wags his tail, licks my hand, and shrugs it off. Whether this is because he believes in a better tomorrow or because Labradors have notoriously short-term memories, his approach seems far more emotionally balanced. Blindbeader: Your dog will test you, period! It varies in scope, intensity, duration, and activity, but almost all new dogs WILL push the boundaries. This does NOT mean that there is anything inherently wrong with handler or dog. I’ve been there, though, at a time when all of my guide dog handler friends told me that their dog NEVER did activity X or didn’t have bad habit Y. Thankfully, we worked through it with a lot of hard work, some frustration, and huge parties on street corners when Jenny took me to the light pole without grabbing the garbage at the bottom of it. If the dog is being unsafe, however, or there hasn’t been improvement (And I mean, even a LITTLE), guide dog schools generally have followup services either on request or on a regular basis; use them! Or ask questions of other guide dog handlers, who have been in the trenches and can offer a variety of suggestions. I just have to remember that many first-time long-time handlers can have selective amnesia. If I ever get that way, knock me upside the head! Francesca: Sometimes, work can wait. Even when my dog isn’t in harness, rarely is he off-duty. Even when we’re taking a leisurely stroll to nowhere in particular, he is always multitasking, concentrating half on the business of fertilizing the neighborhood grass and half on the business of ensuring that I don’t sprain my ankle falling over a tree root. Whenever he tosses his favorite toy into my lap or wedges his nose between my hand and the laptop keyboard, he reminds me to check the proverbial warning light on my brain’s battery and occasionally power down and recharge. Blindbeader: I so second this one! If a guide dog has time to be a DOG, to bond with his/her handler, it does make him or her a better guide in the long run. It took me about six months to realize when Jenny was exhibiting more frequent distracted behaviors, then it was time for a good long run, or a seriously wicked game of tug. That done, she would be able to focus on her work, and everyone was happier. Francesca: Learn to let it go. One day, my dog stopped me from falling off a drop in the sidewalk because I was far too intent on a conversation with my friend to notice the change in elevation. The moment we got home, he immediately rewarded himself by, for reasons which remain clear only to him, stealing a pair of my underwear from the laundry basket. While I naturally corrected him for this, I didn’t dwell on the mishap with my usual scab-picking intensity, because I was still grateful for the fact that I wasn’t doing the bunny hop on a broken leg. Case in point: things could always be worse. Appreciate it when they’re not. Be prepared for your dog to occasionally make you look really really really dumb. I was in a familiar area while training with Jenny one day, and I told her to move forward. She stopped, I corrected her, and told her to move forward. She eventually did… and led me straight into a gravel pit. Oops! The first thing they drill into your head at guide dog school is “Trust your Dog!” and this has served me well more often than not. Sometimes I get to know why my dog did what she did; other times I just shake my head and just wonder why she chose to quite determinedly run me through that parking lot, but the dog has two working eyeballs, and I certainly do not! Then again, there are times Jenny IS doing something she shouldn’t, making me look silly; in two minutes the dog will forget about it, and you should too! Francesca: You can, contrary to popular belief, perform essential functions without the benefit of caffeine. At least once a week, I am heard to declare that the fact that I feed and walk my dog every morning before I’ve had my first cup of coffee testifies to my undying appreciation for the sacrifices he makes daily to keep me safe. (Including making sure that I don’t mortally wound myself when I attempt to move without first fueling myself with caffeine). There’s a reason I refer to my overly frisky, furry eyeballs as espresso on four legs. One shot of him propels me pretty efficiently through the first fifteen minutes of my day. (On a totally different note) Guide dog school has good suggestions, maybe even great ones, but much of what you learn is done after formal training is over. You will cry with frustration on a day when it all just goes to hell and there’s no rhyme or reason why. You will sing for joy on the first day you just “click.” And you have good days and bad days, sometimes feeling like you have the most intelligent creature on the planet and other times wondering why this little demon from hell is taking up space in your apartment. I don’t mean to sound like having a guide dog is this painful drudgery; trust me, it isn’t! But I have seen so many guide dog handlers get discouraged that things aren’t going well and it isn’t working like it shows on TV or did in class. I LOVE having a guide dog. I love putting in the work to shape her behavior that will make her a better guide and us a better team. Like what you read? Let us know in the comments! Hello! Zeus the magnificent yellow guidedog here. I know, I know, I’m technically an adult now, and I ought to have stopped believing in you a few months ago, but it’s important to keep the magic alive. Humans don’t appreciate that. Truthfully though, I need a favor, and I thought seriously about bypassing you and pleading my case with the man upstairs because it’s such a rush order, being Christmas Eve and all, but since it’s his Birthday tomorrow, I figure he deserves a weekend off to have a few martinis and forget about trying to save the world. It must be tough being Jesus. So here’s the deal, Santa. I know it’s a bit of a rush job, but I’d really love some beef wellington for Christmas. I was going to ask for a deer antler, but I realize that’s a sensitive request, and Rudolph and I are great pals, so I wouldn’t want to be on the outs with him because he’s promised to hook me up with a glow-in-the-dark navigation nose just like his, which will be useful for guiding mom in the dark. Anywags, Santa, I know I haven’t been very nice this year, swallowing foreign non-digestible objects and such, but I was only a puppy at the time, and puppies have a hard time distinguishing between food and, well, things that aren’t food. I really didn’t think it was necessary for mom to leave me in the hands of strangers who proceeded to do something called an endoscopy—which is really just shoving a camera down my esophagus, but they call it an endoscopy because giving it a fancy name means they can charge $1200 for it. Then when they determined that whatever foreign object I ingested was too large to retrieve with the Edward Scissor hands camera-thing, they actually cut my stomach open! They called it surgery, but again, the harder it is to pronounce, the more money you can charge for it. I’ve got these crazy humans’ numbers. I felt like the wolf in Little Red Riding-hood, except for the fact that I don’t eat small children, though admittedly that was a fairly large object they pulled out of my stomach. Mom still doesn’t know what it is, and I’m not going to tell her, but between you and me, Santa, rumor has it she needs a new pair of running shoes. I can’t tell you how I know this. It’s classified information, but I know she hasn’t been able to find them recently. Anywags, after two days, Mom finally came to pick me up from the hospital, and Santa, let me tell you, if that was Mom’s idea of sending me to a hotel for all the hard work I’ve done this year, I demand a refund. There were pointy objects, and strange rough hands that didn’t feel at all like Mom’s. If I thought my troubles were at an end when I got home, I was sadly mistaken. Mom proceeded to fit something over my head called an e-collar, which is supposed to stop me licking my stitches. It looks a bit like a lampshade, and Mom’s taken to calling me lampshade head. As if that weren’t humiliating enough, she and Grandma kept trying to photograph me in my misery, because they think I look cute. Santa, please! I know it’s down to the wire, but give a guy a break. I hope you haven’t forgotten that car I saved Mom from a few months ago—doesn’t that niceness counteract the naughtiness? If you can’t pull off the beef wellington, can you at least send a message to amnesty international? Because I’m being tortured. P.S: I’d like to register my astonishment at the inequality of refreshment being left for you and your team of magical reindeer; you get the cookies, and quite frankly, I don’t know how you can make it down the chimney with all that extra weight, and all Rudolph gets is a friggin carrot stick? That’s just wrong, man. When Mrs. Clause is in the kitchen wippin’ up my beef wellington, have her make up one for Rudolph too. After all, if not for him to guide your sleigh, you’d be blinder than my mom. The Tales of Zeus, Chapter 3: Zeus Almighty! Greetings, humans. Zeus the magnificent yellow guidedog here again. Mom thought it would be appropriate for me to write a guest post in her blogchallenge to write about something for which she’s thankful from now until Thanksgiving, since today, the thing she’s thankful for involves me. She wants me to tell you that she’s thankful for me every day, but truthfully I don’t think she really appreciates me; I’m still eating only twice a day. Anywags, today Mom is thankful that I’m healthy. Some of you know that I’ve been having issues with an upset tummy for a while, and finally I seem to be doing better, but I have to say, this bland diet Mom says is good for my digestion is bloody awful. Mom is happy because I’m feeling better and my guidework is improving because I’m not feeling sick all the time, and I’m happy because not having an upset tummy means I don’t have to visit that evil place they call the vet. Mom says the vet is a doctor for dogs, and that this vet is helping make my tummy better, but it’s all a sham. Did you know that last time she tricked me into thinking we were going for ice-cream, and the next thing I knew, I was being seized and dragged into the torture chamber. I know I oughtn’t to have fallen for it, and I’m ashamed to give my fellow Labradors a bad name, but I won’t be duped a second time. Mom is also happy because she doesn’t have to spend money at the vet; apparently the torture chamber has an entrance fee, as if watching me suffer weren’t enough for Mom to bear, but honestly, she’s the one who brings me there in the first place, so serves her right. Finally, I’m thankful that Mom didn’t carry out her threat to dress me up in a Halloween costume. To whoever talked her out of it, my dignity as a dog has been preserved, and I am forever in your debt. Licks and wags to everyone! 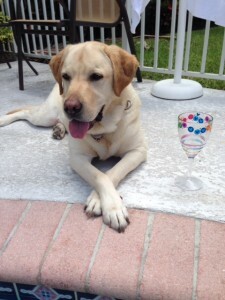 The Tales of Zeus, Chapter 2: It’s my Birthday and I’ll Bark if I Want to! Greetings and salutations to the human internet community. Zeus the magnificent yellow guidedog here, back again by popular demand to make a very special report. On Sunday, October 23, I officially made my rite of passage into canine adulthood. That’s right! I am officially 2 years-old, and a grownup dog! Truth be told, though, I don’t feel much different, and the other day one of Mom’s friends said I still haven’t grown into my paws yet. Apparently this means I’m small for my age, which, to a newly adult male trying to assert his authority in a human universe, is slightly problematic. Mom and I had a party last weekend, which Mom said was for her, because apparently humans have birthdays too. There was a lot of human food, and that drink they call alcohol. Humans drink the alcohol stuff because they say it makes them funny. Personally, I don’t know why they go to so much trouble; they’re already funny enough if you ask me. They should really take a good look at themselves walking around on their hind legs some time—if they don’t get a good laugh out of it, then obviously they need an emergency sense of humor transplant. Anywags, I hear that when you humans come of age, it’s a big deal because you can legally purchase that alcoholic mess that, quite frankly, makes you look a bit daft. Really. I’d never conduct myself like that in public. Mom told me some funny stories about when she could first legally buy alcohol, but I’m not allowed to repeat them. I figured since I came of age, Mom and her friends would make a big deal out of it, but I must say I feel rather cheated; I don’t really see upgrading from puppy to adult kibble formula as an acceptable marker of my rite of passage into adult masculinity. Mom could’ve at least stuck a candle in my food dish or something. Geez. The only real thing of importance that happened was when Mom sat me down and told me that now that I’m 2 and a grownup dog, I have to start acting like an adult, because I’m the man of the house. Mom used to have a boyfriend, but I don’t know what happened to that, so now she needs a real man to take care of her. Mom says she can take care of herself, but she’s terrible at it, really. Just don’t tell her I said that. So: Mom says that being grownup means I’m not allowed to jump on people, or look cute, or put things in my mouth that don’t resemble food. I’m really starting to think that being a grownup isn’t all beer and kibble. Mom says it’s time to go—we have to go to one of her classes she teaches at night, and I love those because it means I get to stay up way past my bedtime. Before I go though, I need to ask one favor: apparently next Monday is this day you humans call Halloween; I don’t know much about it, but Mom keeps talking about how she wants to dress me up in something called a costume. How utterly absurd! What is wrong with my shiny yellow coat, I ask you? Besides, grownup dogs don’t participate in such puppyish behavior. Please intercede with Mom on my behalf and beg her not to subject me to this torture! Bye for now though; licks and wags to all my human friends! Greetings, all you non-furry humans of the interwebs; Zeus the magnificent yellow guidedog here, wagging my way into the blogosphere by popular demand. My human mom told me I could play around on this computer contraption while she’s busy working on her what’s-it-called…diss-diss-diss-er-t-tation. (Such a big word for a little puppy like me!). I’ve only been living with mom and going to school with her for five months, and I’ve already learned so many big words like: theoretical, literary, adaptation, and episteme-episto-epist-I can’t say that one. (Mom just came in: it’s epistemology). I don’t know what they mean, but between you and me, I don’t think mom does either. Anywags, Mom and I have been a team for five months, and she’s probably told you all about the bad things I do like eating her shoes and trying to make friends with squirrels, but I bet she doesn’t ever talk about all the awesome tricks I can do (You humans are all such ingrates. Like taking one shoe is going to counterbalance the car I saved you from last week, Mom. OK, so it was more than one shoe, but that *was* a big car! Credit where credit is due, please). I’m luckier than your average pup, because I get to travel everywhere mom does and be her eyes; I don’t know what’s wrong with hers, but I’m sure glad she needs MINE! It’s awful to be a puppy out of work in this unstable economy. It’s my job to help her find things—like stairways, doors, and street-crossings, and to keep her safe. I think I do a fairly decent job, but mom says I’m still learning and I’ll get better when I’m older. Hmph. I’ll have you know I’m almost 2 years-old—that makes me almost a grownup dog! And allow me to remind you about that car; just to put things into perspective, I weigh 61 pounds; that car weighs, like, a million. I put my little Labrador self between mom and that car, because that’s my job, and I do it well, so there. Mom takes me to this place called THE UNIVERSITY, which is where her “work” is; she trains other humans—imagine that (but she calls it teaching. Whatever, same thing to me). How can you humans think you’re good at training dogs when you’ve got to train your own kind too? I don’t really like this teaching gig; I’ve got to lie down at the front of the room and just look like a yellow rug, and mom’s students—who I guess are like human puppies—aren’t allowed to pet me or talk to me, because I can’t be distracted when I have my harness on. I like wearing my harness because it tells people that I’m a special smart dog, and I get to leave my paw prints where other dogs don’t, but I have a really difficult time with the don’t-pet-me part. Sometimes people walk buy and pet me without saying anything to mom or even asking if it’s OK to pet me; then Mom thinks it’s my fault, because she can’t see that the human who can’t read the “don’t pet me” sign started it, and I get corrected. The injustice of it makes me want to growl! So a word to all the humans, if you see me or another guidedog on the street and think we’re cute (which none of us would disagree with) the kindest thing you can do is smile and keep walking. For one thing, it helps me to do my job and keep mom safe; for another, it keeps me from getting in trouble. I hate it when Mom yells at me, so please don’t give her a reason to do it. Also: if you leave me alone, or stop to tell mom what a smart dog I am without petting me, she’ll give me lots of praise and pets anyway, and Mom’s pets are better than anyone’s, because she’s my mom, and I love her like crazy! The other thing I don’t like about mom’s teaching is that her puppies bring food, and they don’t share it with me because I’m not allowed to eat when I’m working. Geez, ever heard of a business lunch, Mom? Speaking of food, I really must protest to this business of only eating twice a day. I’m a growing boy, you know. I think that in a gesture of acknowledgement to the English lineage of my breeding, we ought at least to have afternoon tea; I could really fancy a cucumber sandwich about now. That reminds me: when Mom is working, she talks a lot about this English person…What’s his name…Colin something-or-other…oh right, Colin Firth. (I just looked him up on Wikipedia). She says he’s done a lot of really great work in literary adaptation (there’s another one of those big words) and she really loves teaching about him and would love for us to meet him some time and chat about his work. Personally I think he’d be more interested in me than in Mom, because I’m way cuter and smarter than she is. This Colin Firth person must be important, because Mom says if we ever got to meet him, she’d let him pet me if he wanted, EVEN THOUGH I’D BE “WORKING”, because he’s Colin Firth. Personally, unless this Colin Firth walks around with sausages (or cucumber SANDWICHES) in his pockets he’s willing to share, I’m not too fussed about the petting, really. Anywags, Mom says it’s time for me to wash my paws and get ready to eat; I’m starving! Licks and wags to all my human friends!